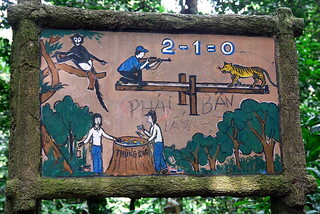 Our favourite was this anti-poaching sign, not only is it pointing out that when you kill one animal it is like killing both because they can no longer mate, but also that there is balance and if the hunter shoots the animal even he will be affected as he sits on the seesaw with the animal. In Australia the sign would just say “Don’t shoot the wildlife”. 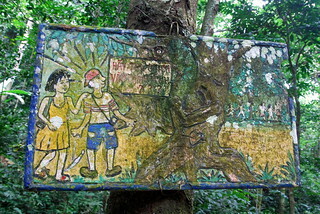 Similarly, this sign to protect the oldest tree in the park depicts the tree coming to life and being angry with a young couple who have inscribed their names on its trunk. Thanks Simone, we having a great time. Hope things are all well back home, and look forward to catching up when I get back over some gingerbread!